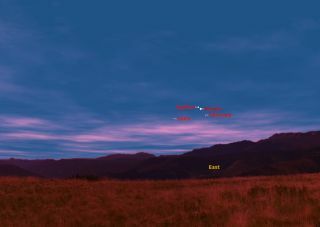 This sky map shows how the bright planets Venus and Jupiter will converge in the early morning sky on May 10, 2011 just before sunrise. This graphic shows the sky at approximately 5:45 a.m. from mid-northern latitudes. The planets Mercury and Mars (noted) may also be visible. The planet Venus is still a glittering "morning star," which this week is rising about one hour before sunrise. About a half-hour before sunup, if you face due east, it can be seen hovering about 5 degrees above the horizon (your clenched fist held at arm's length measures 10 degrees in width, so Venus will stand roughly 'half a fist" above the brightening dawn horizon). Although this is not very high, it still shines brilliantly at magnitude -3.8, and trying to keep track of it can be fun as it fades out in the growing light of day. On this astronomer's scale, smaller numbers represent brighter objects, with negative numbers reserved for the brightest of all. But this week, the planet that ranks second to its brilliance will join it. That planet is Jupiter, which was a bright fixture in our evening sky until it passed through solar conjunction in April and transitioned into the morning sky. On Wednesday morning (May 11), the two brightest planets will converge to create a temporary alliance low in the eastern sky. The sky map of Jupiter and Venus here shows how they will appear on May 11. Venus will appear to pass 0.57 degrees — a trifle larger than the apparent width of the moon — below Jupiter. Those blessed with clear skies and a wide-open and unobstructed view of the eastern horizon will see this "double planet" shining through the bright morning twilight. Jupiter will appear noticeably dimmer than Venus — it's only about a fifth as bright, yet at magnitude -2.1, easily outshines any other star. Remarkably, also in the immediate vicinity are two other planets, Mercury and Mars — part of a monthlong planetary summit meeting — but they're much fainter than Venus and Jupiter and more difficult to see. You might even try looking for Venus and Jupiter during the daytime, but if you attempt this challenging observation, do not sweep for it with binoculars or a telescope, as serious damage to your eyes can result if the full blaze of the sun is accidentally encountered. Probably the best and safest technique is to point your telescope or binoculars (if you can mount them to a tripod) at a star having nearly the same declination as the dynamic duo the night before. Record the time, and then leave your telescope stationary to allow the rotation of the Earth to bring Venus and Jupiter into your telescope's view after sunrise on Wednesday. I would first recommend looking for the famous "Summer Triangle" composed of three first magnitude stars: Vega, Deneb and Altair. The Triangle first comes into view at midnight, low in the east-northeast sky, but will have climbed high up in the south-southeast part of the sky when dawn breaks about two hours before sunrise. The part of the Triangle to concentrate on is around the star Altair, the lowest of the three stars. Altair is set apart from Vega and Deneb because it's flanked by two dimmer stars. Above Altair is the third-magnitude star, Tarazed and below Altair is the fourth magnitude star, Alshain. Located about one-third the distance from Altair to Alshain is a fifth magnitude star, Xi Aquilae. If you live in a light polluted area, you'll need binoculars or a small telescope to find this star, but once you do, you will have found your target object that will be ideal for the purpose of helping you find Venus and Jupiter in the daytime. Jupiter and Venus will glide through the same field of view 5 hours and 38 minutes later. Of course, to get both in the same field of view, a low-power, wide-field eyepiece is preferable. In addition, pre-focusing your telescope will aid greatly in locating Jupiter and Venus by day. It also will help if the sun is hidden behind some obstruction like the roof of a house so that you and your telescope are in shadow with no part of the scope sunlit. Venus will appear as a tiny, gibbous-shaped disk, while dimmer Jupiter will appear as a full disk more than three times wider. Once you know which part of the sky the two planets inhabit, if your sky is very clear and transparent, try to see if you can spy Venus with your unaided eye as a tiny white speck against the blue sky background. As May progresses, Jupiter leaves Venus behind, rising earlier and climbing higher in the east each morning and appearing in a darker night sky.